By Sanura Weathers of My Life Runs On Food. Among my circles of friends, I straddle two styles of communication between older and younger adults. The difference in their communication approach is their perception of social media. My older friends avoid it, but they use it for networking purposes to benefit their careers. My younger friends over expose their personal lives on social media. And, when both groups discuss social issues, the divergence of opinions are apparent, but they all agree the Civil Rights Movement is evolving. Older generations remember Martin Luther King’s speeches. Back then, they were the young kids who marched with their parents. Their sense of community is strong as they remember successful Black-owned businesses. And, when they talk about the younger generation’s involvement in the Civil Rights movement, they’re disappointed. They have plenty of good reasons. To try to talk to some kids about past and current events is frightening. After all, history books sugarcoat facts and lack African-American history. Younger adults’ social media topics tend to promote superficiality and lack spiritual substance. These past few years have been an awakening moment for younger adults. Being straddled between generations of friends, I feel like a canary sending warning chirps (or tweets) that fall on ears covered with massive headphones blasting vile words into sleeping minds. And, then one of their own unfairly falls dead at the hands of a police officer or a community watch person, in which the legal system allows the murderer to walk away from the emotional chaos. Police Brutality has always been a part of the African-American experience as mainstream Americans lack the empathy to care about human rights issues being violated not far from their homes. Trayvon Martin wasn’t the first innocent victim to be murdered by someone who continues to freely walk free. To know the era of the civil rights movement of older adults is to understand this generational dynamic: There are living, older white people who gleefully recall their childhood memories of watching their parents hang African-Americans from trees while eating fried chicken made from an African-American cook. Today, they freely walk around their communities with the help of a cane or a wheelchair while receiving assistance probably from an African-American nurse. As young minds slowly awake to a continuous unfair justice system that has disguised itself as being modern and separate from the past, their appetite for African-American history is voracious. What older adults fail to see is how fast young adults are learning and critically applying their knowledge by first questioning mainstream America’s attitude towards race relationships: “How could anyone continue to ignore the lack of equality and justice for African-Americans?” Hence the emergence of providing examples of individuals’ “White Privilege” behavior and comments. To many older adults, how younger adults organize themselves into a movement doesn’t seem effective. I wonder if it’s because younger adults are in the process of learning about their history. After all, they’re swapping years of sugarcoating history lessons for the raw truth. Or, maybe they always knew their history, but thought they were far removed from the past. And, are past tactics, such as marching in the streets effective today? Perhaps, younger adults’ process of learning allows them to try new tactics, such as the football team who refused to play until an unsympathetic white university president stepped down from his position. The team took a page from the past Civil Right’s playbook of working together as a community. Online media is the communication tool for younger adults, and they use it at lighting speed. Sometimes I wonder if older adults who question how younger adults’ organize themselves, are the same individuals who don’t or rarely use use social media. After all social media is about cultivating communities. It’s a relatively new medium, and younger African-Americans effectively use it to their advantage. Unfortunately, the group of kids who continue to be absorbed into superficial topics and gossip receive more attention than they need (or probably want). It’s what the mainstream media want us to think about younger adults. However, through younger adults social media discussions, I’m also learning how the media unfairly portrays African-American communities as one-dimensional. After all, it’s not only younger adults who discuss superficial topics, everyone does it. However, there is a growing group of young adults also discussing past and present civil rights, history and offering tips of dealing with subtle racist norms via online media. After all, Black Twitter is a modern version of African drums. I wish to have known these kids’ counterarguments when I was in high school trying to explain racism to classmates and teachers who thought I was crazy. The parents of today’s older adults thought their kids were crazy. To challenge the Jim Crow laws of that era was incomprehensibly insane, because that type of violence to confront was always murderous. And, white people literally walked away free and happy from their actions without guilt (they still continue to walk free today). And, what was crazy about the older generation’s fight, is how peacefully they fought it. Because of the insane level of violence older generations dealt with in the Jim Crow era, they had to be tightly organized. From their perspective, younger generations’ communication methods seem random and loose, but whether younger adults’ organization methods are effective or not, future historians will accurately clarify. Younger adults can be crazy thanks to the insane bravery of older generations. Today, they continue previous generations’ fights by challenging systemic racism. It’s subtle societal norms that are tremendously racist, in which mainstream Americans believe is okay or ignore. Our American culture has never been okay. I straddle my circle of friends of various age groups, to remind them we are one community deconstructing mainstream thoughts about physical and psychological violence against us since the beginning of American culture. Younger generations are now learning more about their history. I have faith in their ability to gracefully soar. They’re going to be alright. Roast sweet potatoes are the ultimate comfort ingredient to appease every generation. In this version, fennel, cumin, parsley, mint and cilantro delicately spice whole-wheat couscous as a savory yogurt tops the dish. Garnish with roast za’atar spiced tomatoes and pomegranate seeds. It makes a full-filling, side-dish, but it’s delicious with seared duck breast or a juicy steak. Preheat oven to 400°F. Line a baking sheet with foil. Place sweet potatoes on top. Roast for 1-½ hours or until the sweet potatoes are soft when squeezed. Unwrap sweet potatoes and and let cool for a few hours. Set aside. Toss all ingredients for roasting grape tomatoes over a foil lined sheet pan in a preheated 400°F oven. Roast tomatoes for about 30 minutes, or until they hint at turning brown and look blistered. In a medium saucepan placed over medium temperature, melt one tablespoon of butter. Add the onion and all the spices, except the garlic. Frequently stir until the onion is transparent for about four minutes. Stir in the garlic for about 10 seconds. Add the orange juice and zest, stock, bay leaf and the optional chili pepper. Cover and reduce heat to simmer the liquids for about 10 minutes. Turn off heat, remove saucepan from the source of heat and stir in the couscous. Cover and set aside for about 15 minutes or until the liquid is absorbed. Using a fork, fluff couscous while adding the fresh herbs. Keep covered and set aside. Whisk all ingredients in a medium bowl. Set aside. Split a sweet potato vertically in half. Be careful to not cut it completely in half to separate. Spoon spiced couscous inside the sweet potato. Garnish with roast tomatoes, pomegranate seeds, and almond slices. Sprinkle a dash of za’atar spice blend. 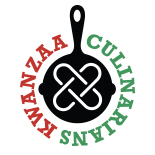 This entry was posted on January 1, 2016 by Sanura of MyLifeRunsOnFood.com in 2015, Imani and tagged Imani, Kwanzaa, My Life Runs On Food, MyLifeRunsOnFood.com, Sanura Weathers, side dish, sweet potato.